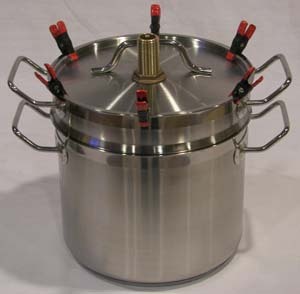 The Amphora Society's mission is to increase the quality of information and equipment available for distillation. We will NEVER compromise quality or functionality for short-term gain, nor will we release equipment that has not been exhaustively tested. We are also very focused on delivering the most value for the least cost possible, so we will not add unneeded bells and whistles to try and command a higher price. Beginning with the publication of "The Compleat Distiller", and continuing with "Making Pure Corn Whiskey", "Designing and Building Automatic Stills", and now with the introductin of "Cordial Waters", we have developed a reputation for "best in class" books, which offer only proven facts and the tools needed to learn enough to design one's own equipment with assurance that that equipment will be of the highest possible quality. After repeated requests to introduce ready-to-use equipment, we responded with the PDA-1, with its revolutionary short column. This apparatus convincingly demonstrated that the widespread belief that a long column was required to obtain quality results was, in fact, a myth. By paying careful attention to the science of distillation, we were able to create a compact, laboratory scale still ideal for recipe development, process design research, or small-scale production. As the quality of the PDA-1 became widely known, we began to receive requests for micro-distillery scale equipment. We responded with the PDA-2, an extremely efficient and fully controllable production-scale distiller. It is modular in design and approach, allowing micro-distilleries to easily increase production capacity in very reasonable increments, at far lower cost than any of the other alternatives. For years, we did not make boilers, believing that it was normally more cost-effective for customers to make their own or to have one made locally. Again, repeated customer demand has convinced us to change that policy. We have designed a series of what we believe to be the best quality, most flexible, and easiest to use boilers available. One of the key focuses of the Amphora Society has always been the "do it your self" customer, as reflected in the encyclopedic design information contained in "The Compleat Distiller". We also offered our unique, extremely high-efficiency pure copper structured packing material as soon as we were able to have it manufactured to our specifications. We have several standard adaptors that allow the PDA-1 or the customer's own equipment to be attached to a variety of standard or custom boilers, and will design and build custom adaptors on request. Copyright The Amphora Society. All Rights Reserved. eCommerce Software by 3dcart.